With Bailey we learned quickly the importance of a chew toy that lasts. We spent a fortune on rawhide, stuffed toys and various piggy parts! Cleaning up after the treats was truly a chore too. Eventually we learned these are the four best choices based on cost, mess, smell and durability. For Bailey these do not last too long but we found leaving them out to “dry” a month of so extended the chew time dramatically. The thickest ones we could find will last Bailey about 20 minutes. Obviously they last much longer for a smaller dog like Teddy and cost much less too. I did not find them to stink, stain or shred into a mess. Sometimes hooves will last for weeks and sometimes they only last an hour. Sometimes they stink horribly sometimes they don’t stink at all. They don’t usually make a mess but occasionally they crumble apart. I couldn’t figure out what the difference was and I couldn’t predict. 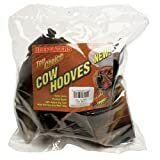 These are my choice for camping or backyard treats since they can stay outside, usually last a long time and are inexpensive. 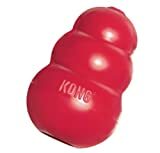 I’ve been really pleased with the Kong products I’ve bought. I haven’t bought a lot of them as they do hold up really well. The dogs prefer them with peanut butter inside or the KONG Stuff’N Easy Treat you can squirt inside. Antler chews are my all time favorite! They last for months, don’t stink, don’t crumble or make any mess at all. If Bailey happens to get hold of Teddy’s little one she doesn’t crushed it up, even after 20 minutes. Teddy will also gnaw on Bailey’s giant bone which looks quite silly! They are more expensive but I’ve found they are truly worth the price.